Disclaimer: I was provided with a complimentary stay to facilitate this review. All opinions presented are 100% mine. I can recall the days of my childhood like they happened yesterday. We had an enormous backyard and a BIG house with a secret little room under the stairs that I used as my clubhouse. My sister and I created all sorts of games that we played to entertain ourselves in the days of no technology. One of our favorite places to play was my father’s garden. He had planted an enormous vegetable garden full of all his favorites like corn and okra. My sister and I had plenty of fun playing hide and seek among the corn stalks. But there was one special place that we called our treehouse. Although it was not technically a real treehouse, our imaginations lead us to believe that the willow tree in our backyard was the perfect treehouse for us. My sister and I spent many hours hiding among the Weeping Willow. Its branches created a protective canopy that was perfect for holding secret meetings and climbing. It was our “treehouse,” and she was loved very much. 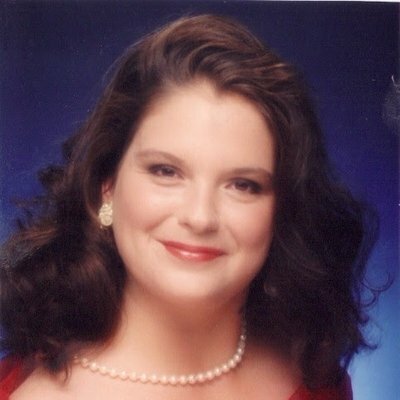 As one would expect, I grew older, and we moved away. The days of my treehouse adventures were over, or at least I thought. 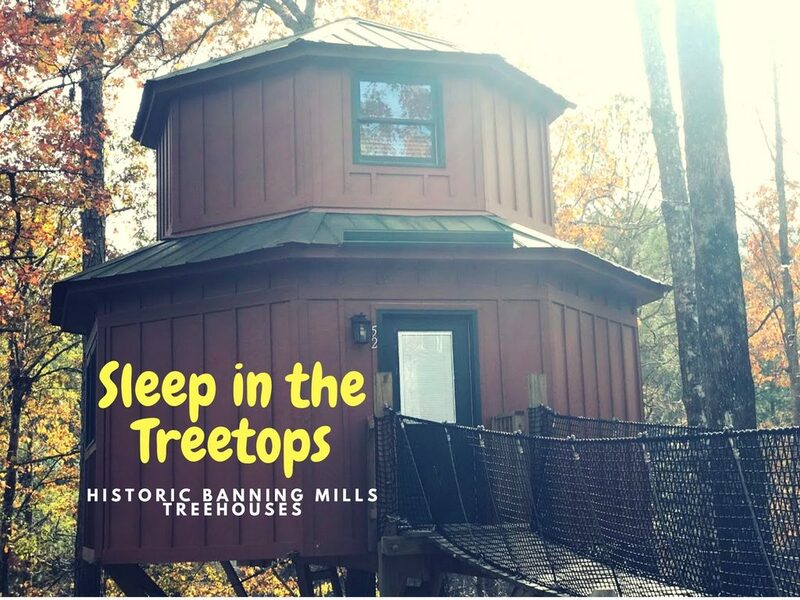 Within recent years we have seen a revival (in my mind) of treehouses. 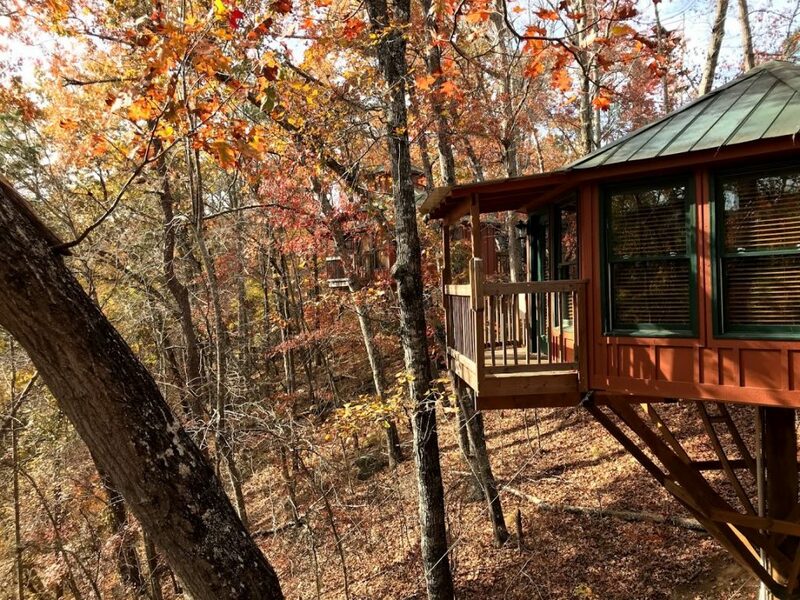 Adults are rediscovering their youth and building treehouses to enjoy. 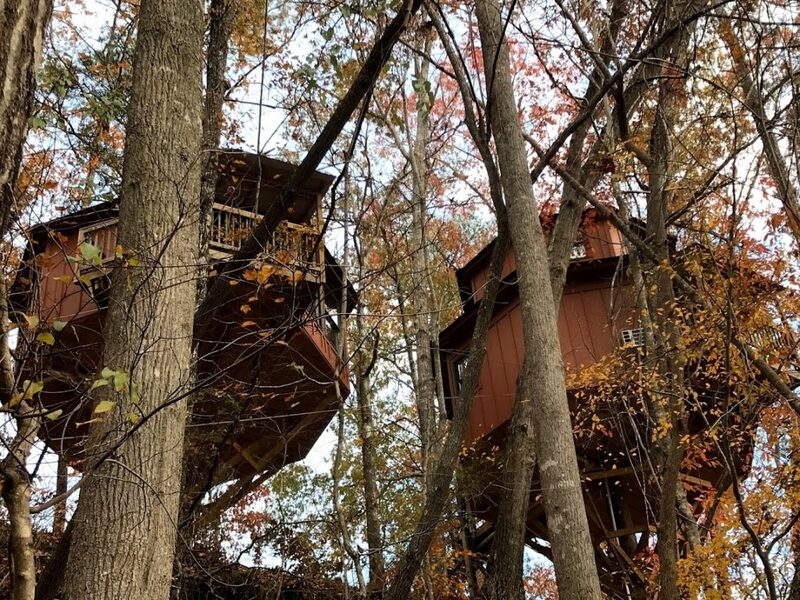 Imagine my excitement when I discovered that roughly 30 minutes away from me was a treehouse village just waiting to channel my inner child to come and sleep in the treetops! 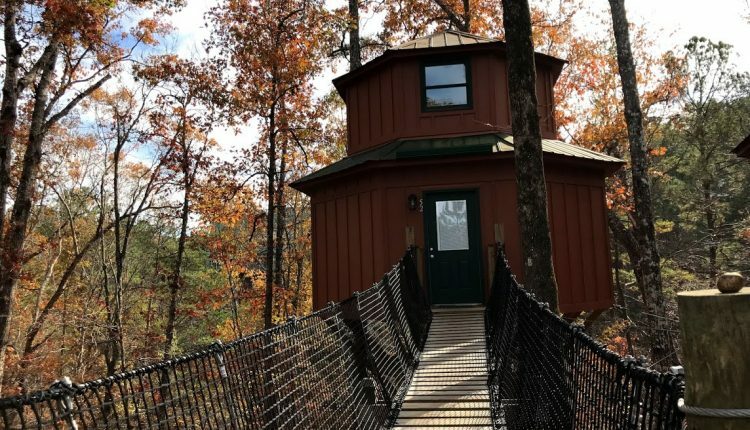 Located in West Georgia, you will find a picturesque outdoor adventure resort covering 300 acres known as Historic Banning Mills. 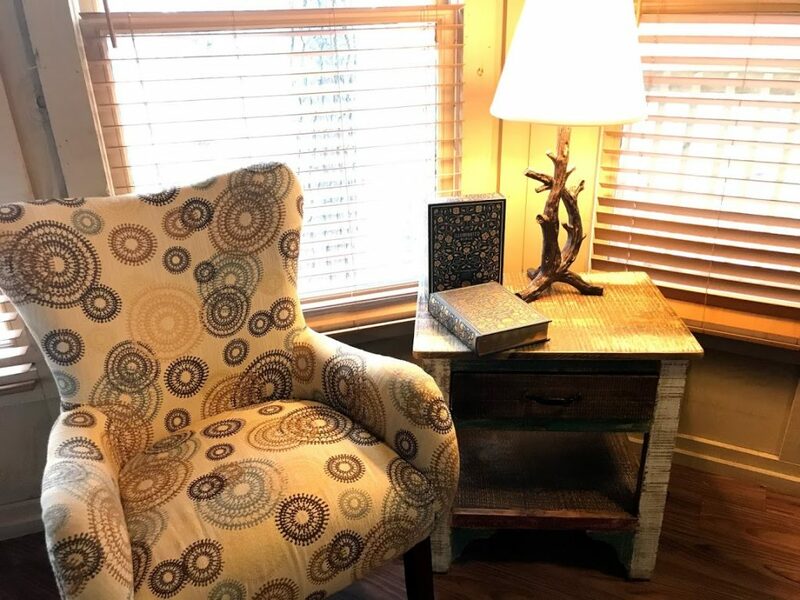 Once home to a thriving mill town located in Snake Creek Gorge, Historic Banning Mills offers guests an escape, a place where you can reconnect and unwind. Adventure seekers can find many thrills including zip lining, kayaking, horseback riding, and hiking. Those seeking rest can find comfort in a treehouse village hidden among the trees. A village of seven treehouses perched 70 feet up above the gorge provides a luxury that is far from what you may have had as a child. 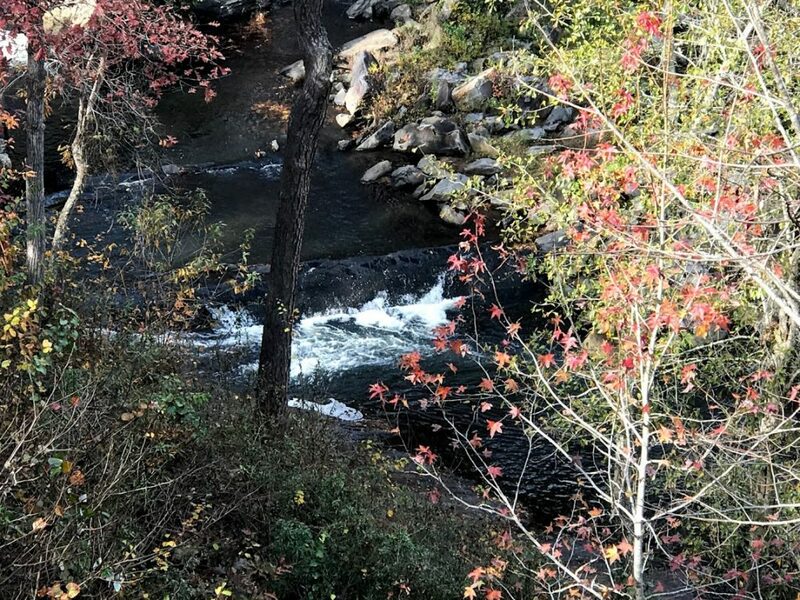 The beautiful scenery of Historic Banning Mills provides the perfect place to relax and escape the hustle and bustle of real life. 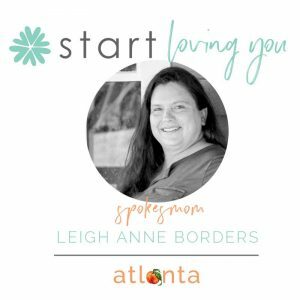 As a family of adventure seekers, we are constantly looking for things that are out of the norm or off the beaten path. Things that you just can’t experience just anywhere. Staying in a treehouse is one of those unique experiences. It takes us back to our childhood where we spent days pretending we were members of the Swiss Family Robinson. 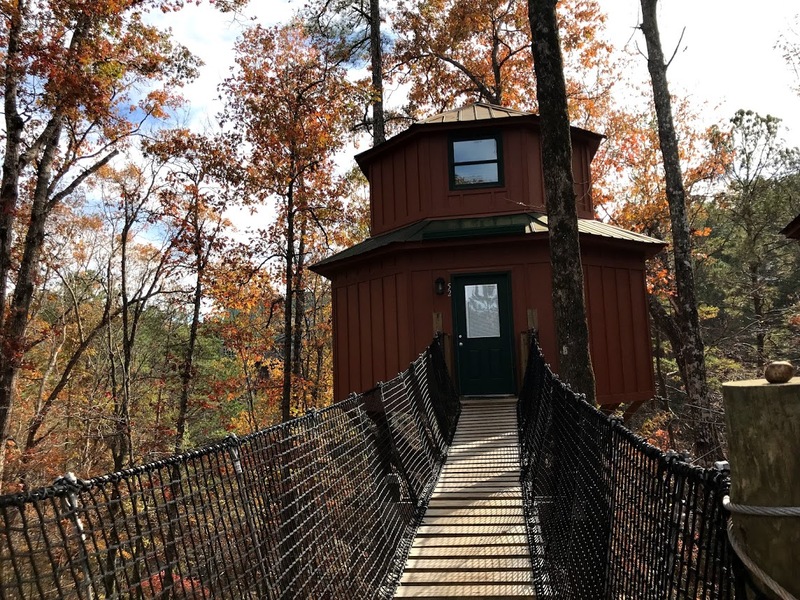 The treehouse village, tucked away in the trees, offers amazing views of the rushing waters of the Snake Creek Gorge and is accessible by rope and wood sky bridges. The treehouse adventure begins with a walk across a swaying suspension bridge. Once you step on the bridge and get a few steps in, you immediately realize that you are indeed heading to an adventure in the sky. It is a unique feeling where you subconsciously have the feeling of fear and excitement all in one. As you safely sway across to the front door and open it, you are immediately blown away by the accommodations. 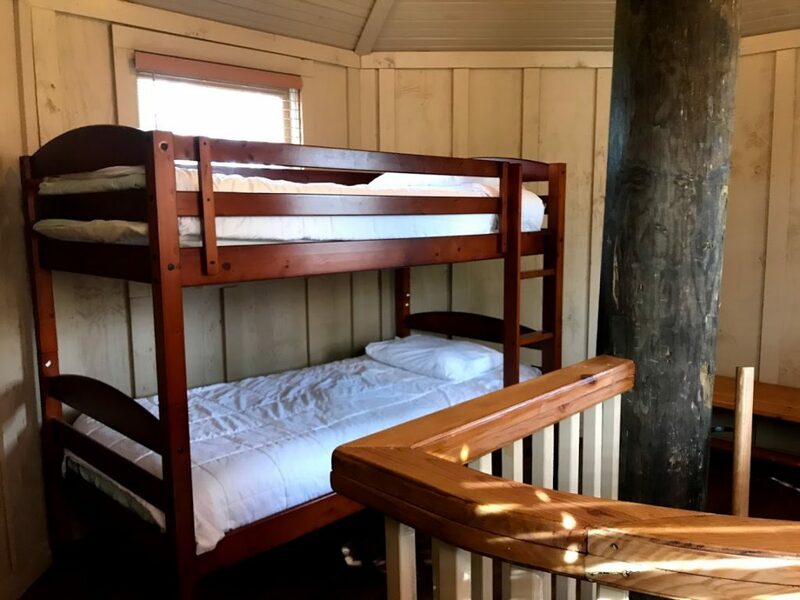 Our two-story treehouse was beautifully decorated and came equipped a king-sized bed, jetted garden tub, shower, and a cozy gas log fireplace for those cold wintery nights. 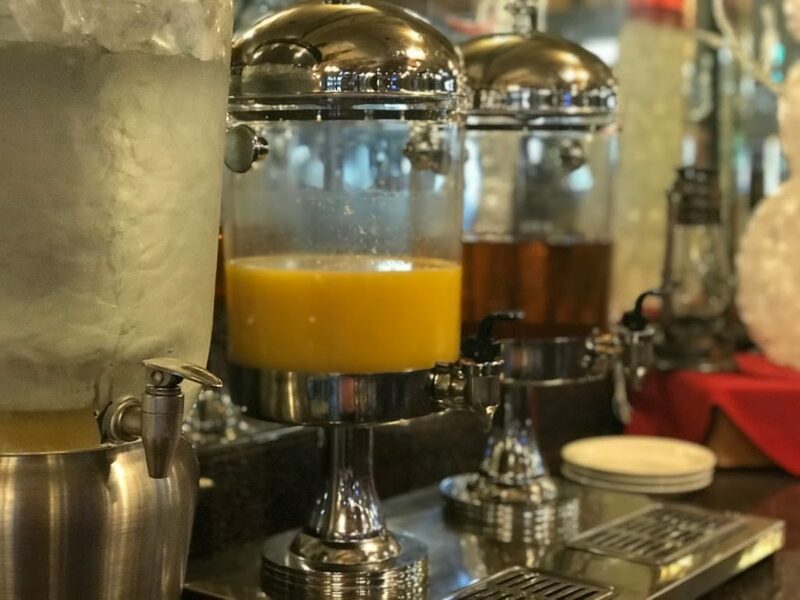 Featuring modern conveniences that we expect in traditional lodging accommodations from the Keurig coffee machine to a mounted flat screen television and Wi-Fi are available for those guests that need to stay connected to the real world. A winding staircase leads to an upstairs bedroom equipped with bunk beds. One of the things that we enjoyed the most was the sway of the treehouse with the breezes that come through. 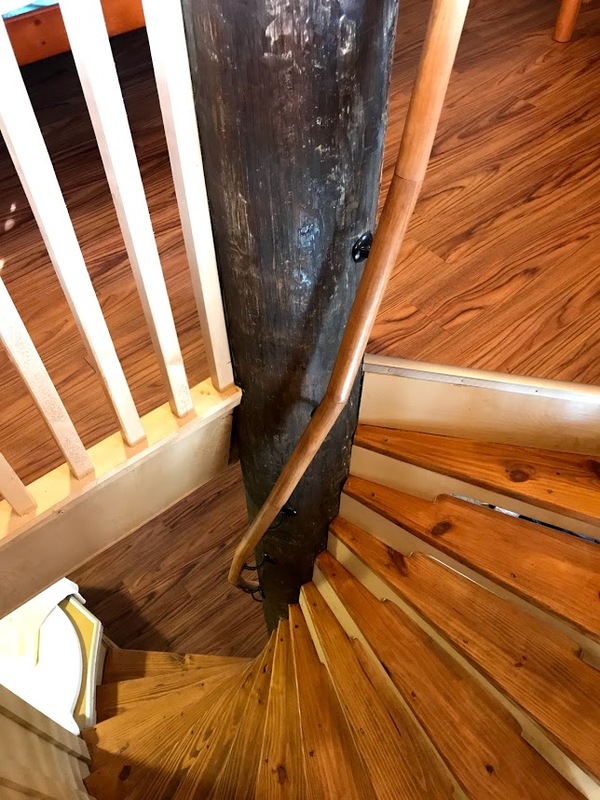 You may think that this provides for unsafe conditions, but it doesn’t! The treehouses are anchored securely into the ground. 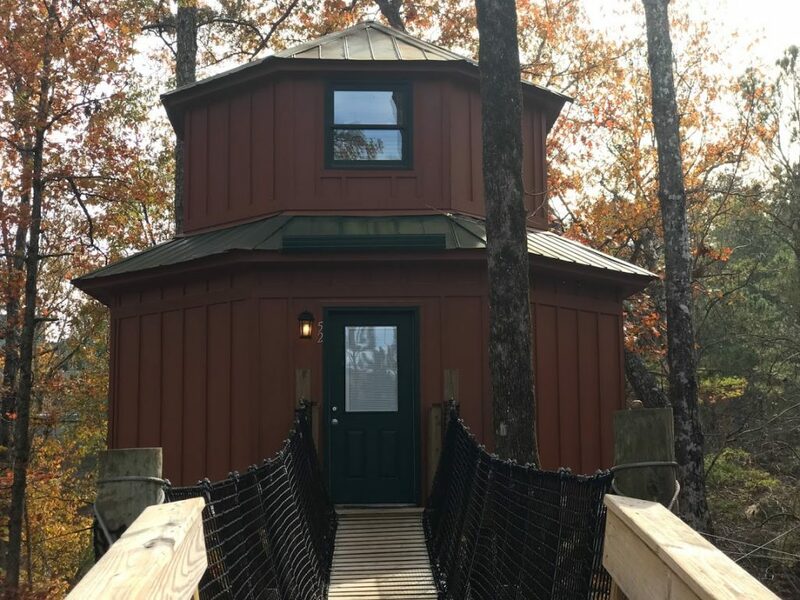 Traditional accommodations are available for guests if you do not want to “branch” out and sleep in the treetops. Guests staying overnight in the treehouses are provided with a complimentary breakfast buffet each morning in the main Lodge. 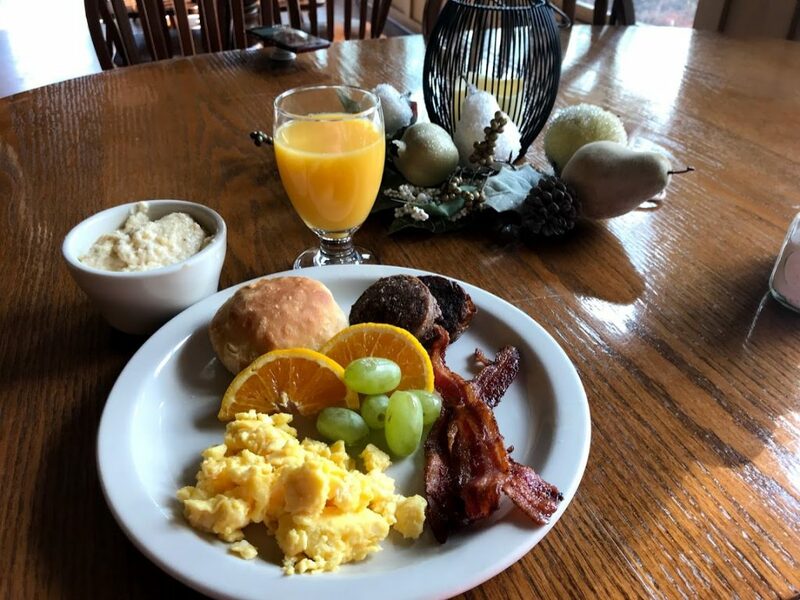 Eggs, sausage, bacon, grits, biscuits, fresh fruits, coffee and a variety of juices provide just the right nutrition to give you what you need for a day full of adventure. Historic Banning Mills holds two Guinness World Records! The first is the World’s Longest Continuous Zip Line Course and Eco-canopy Adventure Tour. Fly through the treetops on the “Screaming Triple Eagle.” This half-mile zip line can reach speeds up to 60 miles per hour. The second is the World’s Tallest Freestanding Climbing Wall, standing at 140 feet. Are you looking for the perfect place to take your loved one to this Valentine’s Day? 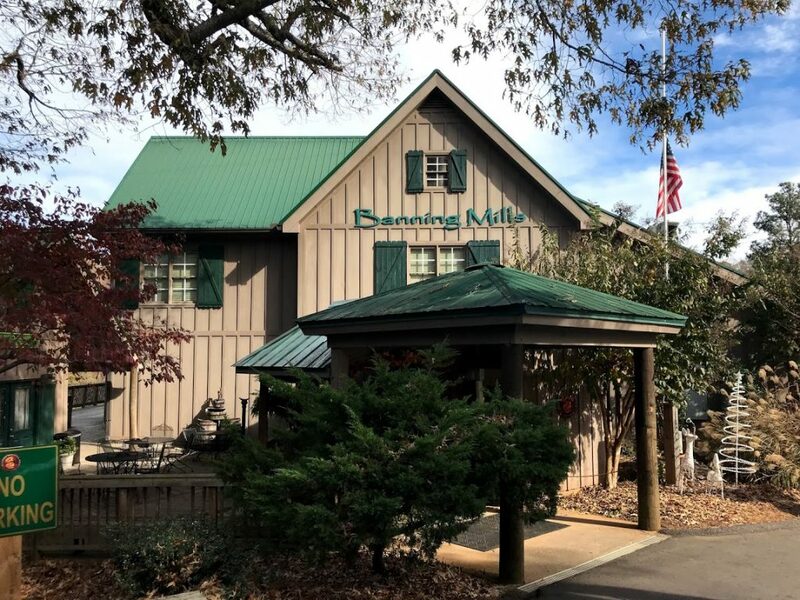 Whether you want to stay overnight or just have dinner, Historic Banning Mills will provide the perfect setting to make it a memorable evening. Between Friday, February 9th 2018 through Saturday, February 17th you can make reservations for their Five Course Meal. All meals are served in the Main Dining Room, and seating is between 6pm-7:30 pm (30min increments). Semi-formal dress is requested. Want to enjoy a night away with your significant other? 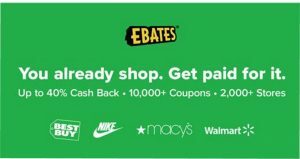 They are offering an overnight package. Reservations are required for either package. Historic Banning Mills Adventure, Retreat and Conservation Center is a 501c3 non- profit organization located in the beautiful Snake Creek Gorge of Carroll County, Georgia, and is approximately 19 miles south of Douglasville and 45 minutes west of Atlanta’s Hartsfield-Jackson airport. Proceeds from the retreat and adventure treks are used to subsidize the educational, leadership and conservancy programs. Historic Banning Mills also has lodging and meeting room options, Day Spa opportunities. They have live Bird of Prey educational shows and two falconry programs. There is a little something for all outdoor enthusiasts at Historic Banning Mills. 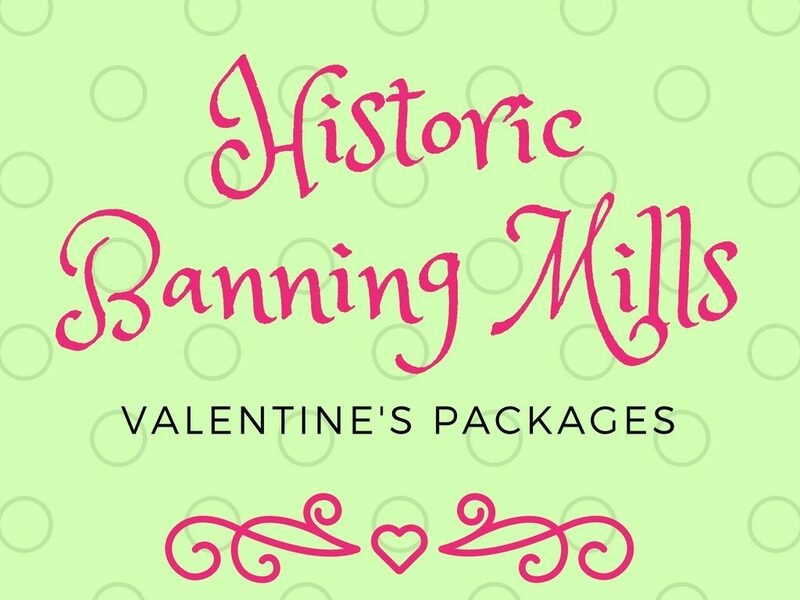 For additional information, reservations or lodging options, please visit www.historicbanningmills.com or call 770-834-9149. Historic Banning Mills is located just 45 minutes from Hartsfield-Jackson Atlanta International Airport in West Georgia. 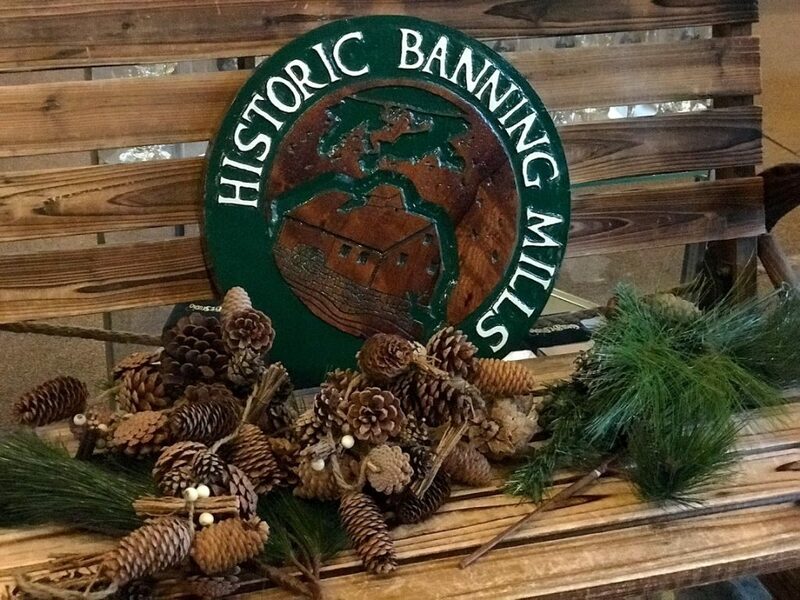 If you are looking for a place to escape to, look no further than Historic Banning Mills. They have something for everyone! This is a fantastic Valentine's date idea! What a great getaway - I feel like so many couples tend to do the same old thing for V-Day. This would be a great change! WHat beautiful memories and an enchanting place. I always say I am a seaside kind of place but then places like this are so magical and I find something so mesmerising with the nature around me. Thank you for the wonderful images. This is one of the sweetest Valentine's date! I like the concept of these accommodation, they are unique and eco friendly. What a cute idea! and fantastic memories that will last a lifetime. Beautiful rooms and views. Love it! This is one of the sweetest Valentine’s date! Beautiful rooms and views. Love it! This is something really different and sounds lots of fun! I saw there is someone who did a treehouse like this they are now in trouble with zoning. My buddy next door built a double decker tree house. All the neighborhood kids like to hang out there. I read a lot of travel blogs that often feature places that are just beautiful, but this genuinely looks like my kind of adventure! I've always been fascinated by tree homes. So pretty. What a wonderful place to explore. Now that is a really neat experience. I would love to book a few nights there. This looks like such a cool little getaway! I'd love to visit here. It really looks to be a great place for Valentine's week getaway. It's something new and amazing. This is the coolest thing I've seen on the internet today. I want to stay in one of these!! oh so love the look of this beautiful place. The stairs are something out of a magazine and the location can not be beat. I am in love of this idea! It's unique and romantic. I llike all the dishes! Wow, this looks like the perfect getaway. I know my family would love to stay here! This is my kind of getaway. It is close to nature and looks really relaxing. Wow! What a cool getaway! 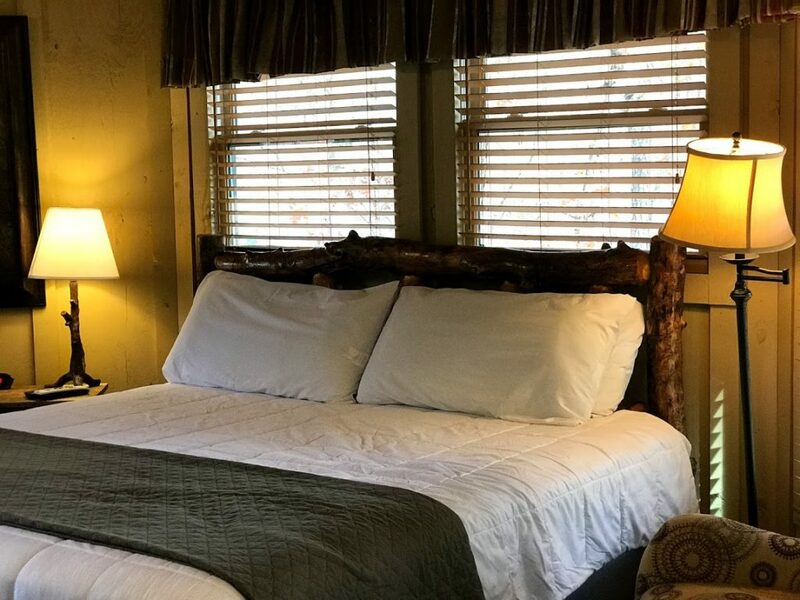 This could be perfect for a romantic weekend or for a fun family retreat.